My designed 'sculpted portals' aim to empower people in their everyday life by facilitating a more conscious crossing of their inner thresholds. I describe my work as mythopoeic wood sculptures with interest in participatory sculptural installations in enigmatic environments. I carve figurative wood sculptures depicting archetypal images. They invite the visitors on a personal journey of experience and thoughts regarding liminality, eroticism and fear – If we want to find our way out of the chaos our world has reached, we need to listen to our inner wisdom and become aware of the subconscious patterns which govern our actions causing personal, social and global impact. Each of the sculptures were conceived in a real life situation and evolved naturally to archetypal level. They are expressions and not illustrations of the archetypes and as such emblematic. Story and poetry are also important elements of my work; not only at an inspirational but often at mythopoeic level as major parts of the expression. They drive the inner movements, which create the forms. I carve my images in all sorts of wood playing with the features of the natural wood to build up unusual effects with various techniques, added materials and small objects. For my work, I am inspired by Prof. Michael Tucker’s thoughts on Art and Shamanism and his book Dreaming with Open Eyes. Hidden in our soul, thresholds of sensibility guard these archetypal qualities. It is like dismantling the soul as the doors get smaller and smaller. In our post-modern culture, rituals which prepared conscious threshold experiences died out or lost their sacred meanings, while due to the accelerated speed of life, the frequency of threshold experiences increased. Many people experience unexpected and spontaneous threshold crossings, often painful, that dramatically shift their perception of life. “The psychological dangers through which earlier generations were guided by the symbols and spiritual exercises of their mythological and religious inheritance, we today... must face alone, or, at best, with only tentative, impromptu, and not often very effective guidance.” /Joseph Campbell/	This installation aims to create an awareness of the crucial issue of threshold experiences. 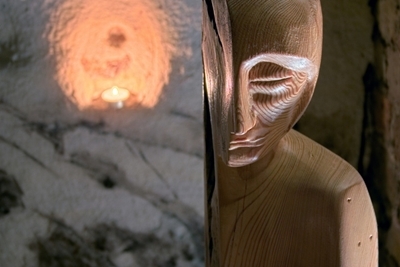 My wood sculptures and the caves interacted in a constructive way. A deep tone of the sculptures that is easily missed in a gallery situation was emphasised in this specific environment. On the other hand, the sculptures acted like medicine to the place. The caves had little changed since they functioned as a public shelter during WW2. A display about daily life during the Blitz established by the Wealden Cave & Mine Society in the front area of the caves evoked this period. The installation of my sculptures in the inner sandstone parts aimed to create a contrasting reflection to this unusual atmosphere. The sculptures were illuminated with nightlights to emphasise the inner search in the maze-like atmosphere of the cave.The exhibition was called ‘RECONNECT’ indicating the attempt to reconnect the energies of the place to its geological origin by moving it to a new phase of history through art work; I had also created a ‘portal’ – a transitional place between the two areas of the cave- for this purpose. If you should experience difficulties viewing the full selection, follow his instruction of changing your flickr site security settings. He had to apply moderate security due to the ‘spooky’ atmosphere of the images.